They say much of it is affordable and "could be usable in five years". They are looking at developing an EEG (electroencephalogram) device which fits in the ear to monitor fluctuations in brain activity and using radar technology to track people's movements in their own home. The aim is for sensors around the home to pick up changes in patients' behaviour which could put them at risk of being admitted to hospital, such as a change in walking pattern that could lead to a fall, or an increase in body temperature which could suggest an infection. Trevor Truman, whose wife was diagnosed with Alzheimer's disease in 2016, tested some of the technology as part of a trial in his own home. "When we visited the GP, we were able to take my wife's data with us - using the app on my tablet - giving our GP an instant overview of her health and recent history. "New medication was prescribed that day. "It was quick, efficient and effective for us." At one point, Mr Truman had up to 20 separate sensors or devices gathering data in his house - some monitored sleep patterns, room temperature or unusual movements. Others monitored weight, body temperature and hydration levels. "They will allow us to intervene at an early stage, to prevent crises that so often lead to hospital stays, or a move to a care home." One in four hospital beds is occupied by someone with dementia - and 20% of these admissions were due to preventable causes, he said. The ultimate aim is to create "healthy homes" for people with dementia to live in using the technology. 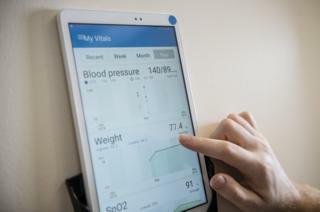 Payam Barnaghi, professor of machine intelligence at the University of Surrey, said: "Doctors will be able to have confidence in their ability to monitor people remotely and to react quickly to any worrying changes. "Improving the quality of life of people with dementia is crucial to their and their families' overall wellbeing."